Equities start the day slightly higher as we FINALLY get a piece of good news. What is this majestic gem of happiness I speak of? Mastercard is splitting their stock. Whoa, back up, did you just say a company is actually splitting their stock? Yep, and it’s a doozy.. A 10 for 1 banger on a $700 name…just glorious. In Monday’s recap I linked to an article stating that only 11 companies in the S&P had split their stock this year. Well make this 12, and hopefully 13,14, and 15 will be right behind. Now I get why companies have stopped splitting their stocks, they are tired of high frequency chippers and probably don’t really care about the composition of shareholders anymore (retail vs institutions). Plus, I’m sure there’s a bit of panache to having a high priced stock. Rolexes don’t look so cool with a $100 price tag. $10,000 tag? Luxury baby. But having MA split their stock gives cover to other companies to do the same, and from a selfish perspective brings volume back to the name. MA averages 600,000 shares a day with its lofty price, now it will average WAY more. Cash equity volume continues to die, for a number of reasons, but a lack of splits is definitely one of them. Splits…..that’s the gift that keeps on giving the whole year. That it is Edward, that it is indeed. After the open we plummeted in nearly a straight line. I mean it was going down…I was yelling Timber. In fact the S&P spent the entire first half of the day twerking itself down to 1,786. Bad news? Nope, sentiment. Check out the II readings today: “Bullish sentiment increases to 58.2% from 57.1% in the latest US Investor's Intelligence poll. Bearish sentiment unchanged at 14.3%. Those expecting a market correction decreases to 27.55% from 28.6%” Those are lofty…super lofty. I pulled this chart off a financial blog (here) and what it shows are all time levels of bullishness (even above 2000 and 2007). So yea, one of the main things I worried about was consensus surrounding a Santa Claus rally. People just expect it, assume it will come, bank on it. My personal view is that all this shoddy price action is the market punishing consensus dwellers, not taper fears. 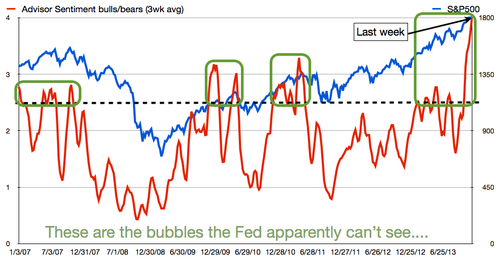 I might be wrong though, maybe it is taper fears. This budget deal takes another worry off the table for the Fed. I might have to ponder this over a glass of Pappy (I swear it’s all we talk about at our desk. Such a bubble). Winners were mostly consumer staples, which is the kind of action you’d expect in a pukeoff. WAG / SJM / KO / WFM (can you believe WFM is considered a consumer staple? Berries from the Jungles of Costa Rica? Fresh bottled air from the Nidwalden canton in Switzerland? Very stapley). Other winners were SNI, URBN, IRM, and V /MA. Obviously lots of losers with most of the pain being felt in small caps (RTY significantly underperformed). By lunch we sat on 1,788 down 75bps. The last hour saw more red than an Overlook Hotel hallway and we closed near the lows, 1,782, down 1.1%. All of 8 names in the S&P rose more than 1%. Yikes. Whither Santa? Did he get stuck in the snow? Actually Santa is the exact reason we aren’t rallying…to many people sitting by their chimneys waiting. As with these two guys you have to expect the unexpected, and a loss of 1.1% on Dec 11 is certainly unexpected. What happens next? I’m glad you asked. Frankly we are a bit oversold, I’d expect a stabilization trade soon. Then we get no taper next week and the market pushes back to 1,800 where we tread water until year end. That’s the road map, or at least that’s what I think the road map looks like. Budget deal means higher chance of Taper? That’s what the media is going with for this selloff? Final Score: Dow -81bps, S&P500 -113bps, Nasdaq -129bps, Rus2k -162bps. Christmas Carol of the day: Mr Tanner. 3 very bearish charts. The second one is why we are so weak lately. Factoid of the day from Trim Tabs: “U.S. bond funds post record outflows at $70.7 bln year-to-date, eclipsing prior record $62.5 bln in 1994”. 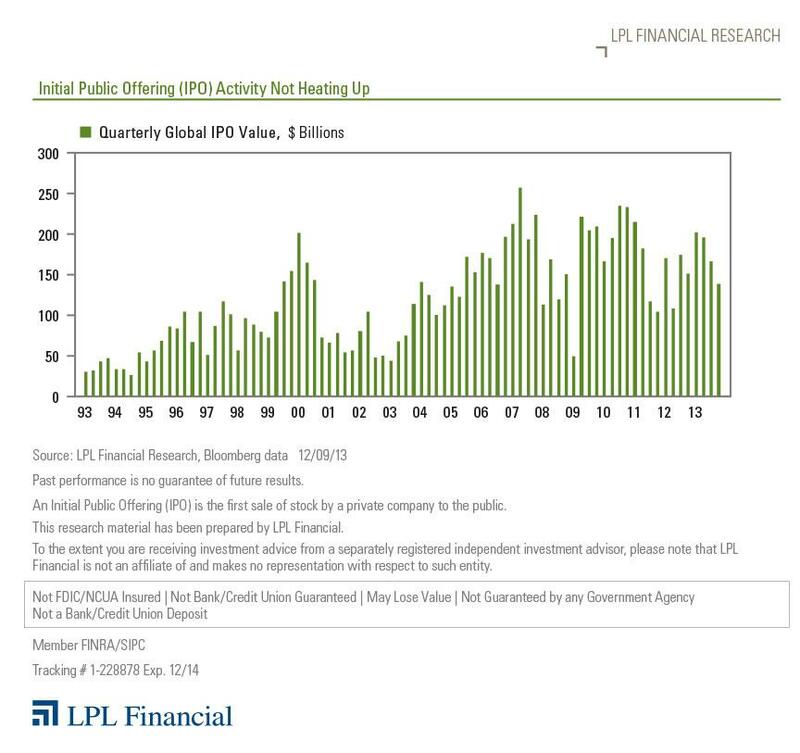 What inning do you think bond outflows are in? I’d argue the 1st? 2nd? Having an opinion on this is critical to your 2014 thought process. Bill updates his outlook for stronger economic growth: Eliminating drags is important. The drag from state and local governments is over. The drag from household deleveraging (in the aggregate) is ending. The threats of a government shutdown, not "paying the bills", and mindless austerity is over (assuming the budget deal is approved). And CRE investments are starting to appear. Pretty cool 7 page article on Passport Capital. SF Based hedgie…a nice read if you have the time. I’ve been to exactly one of these places…Basel…such nice clients there. Berne is gorgeous too. In fact I’m not surprised Switzerland has so many places on this list. 21 dodges. 21 dodges in 10 seconds. We’ll end tonight with a look at the many ways a person can remove a bottle cap. Personal favorite? Gotta be the rocket. Or maybe the helicopter. The pizza? Wow.